Cookie Pieces in a White Chocolate Flavoured Candy. A lot of Hershey's Happiness in a little drop. 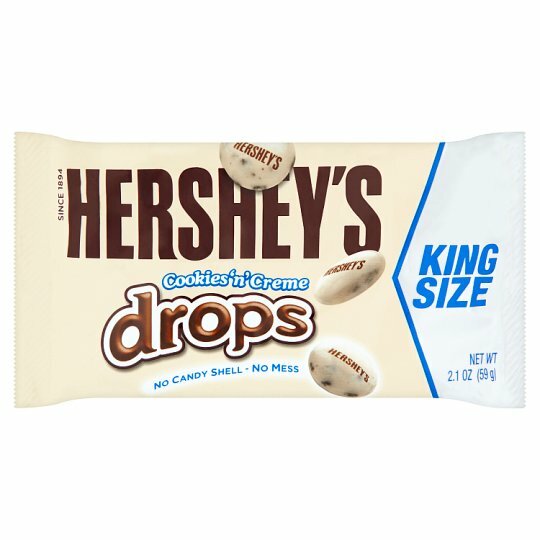 Enjoy the bite-size goodness of Cookies 'n' Creme Drops, without a candy shell and without the mess. Hershey's Cookies 'n' Creme Drops are perfect for snacking and sharing. Pure Hershey's Happiness - anytime, anywhere! To keep this product in perfect condition store in a cool, dry place (16 to 18ºC) and consume before the date given. Allura Red (E129) and Tartrazine (E102) may have effects on activity and attention in children.